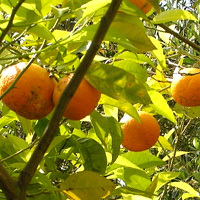 Bitter orange or daidai in Japanese is a bitter-sour citrus fruit that may not be fit for eating in the same way as oranges. However, it still used to make ponzu vinegar and marmalade. It contains slightly less vitamin C content than larger Valencia oranges. The calories in Bitter Orange per 60g(1item) is 14 calories. Bitter Orange is calculated to be 24Cal per 100 grams making 80Cal equivalent to 333.33g with 4.8g of mostly carbohydrates、0.18g of protein、0.12g of fat in 60g while being rich in vitamins and minerals such as Vitamin C and Potassium.